A CDA 1.2 default installation limits the maximum upload size to a little over 1GB. This limit can be increased by a CDA admin. Select the Administration tab – Configuration [left menu option] – System Settings [central window]. Type ‘max’ in the name window. 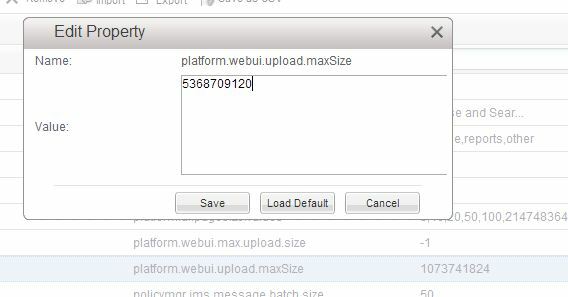 Then select the Edit option for the system property to be changed [platform.webui.upload.maxSize] and set as required. Once this change has been saved it is necessary to restart the CDA service before the new setting will be effective.